Home > *VALENTINE'S DAY > CHEERS TO US! 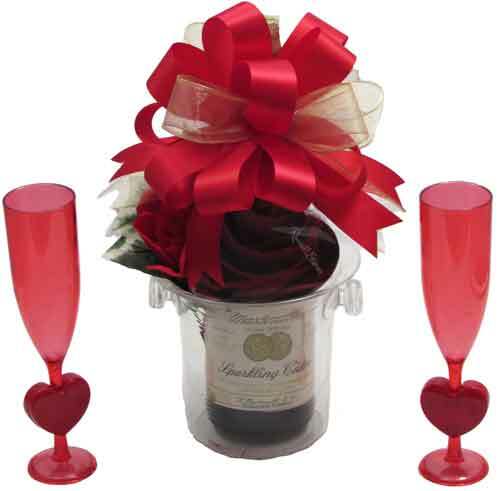 This plastic Ice Bucket holds a 750 ml bottle of Martinelli's Sparkling Apple Cider, a heart shaped box of Russell Stover's Assorted Chocolates, and two dishwasher safe plastic Champagne Flute Glasses with hearts on the stems. We've added a silk rose and greenery. Wrapped in crisp clear cellophane, and topped off with a handmade bow. The glasses are tied on below the bow. Includes a Handwritten Greeting Card. Note: The heart shaped box of chocolates will be replaced with Ghirardelli Chocolate Squares when it isn't Valentine's Day. Limited quantities.